Wikimedi Commons, Paolo Costa Baldi, CC BY-SA 3.0, 2010-12-24. Te­puis sind Ta­fel­ber­ge, die im nörd­li­chen Süd­ame­ri­ka vor­kom­men und aus Sand­stein be­ste­hen. Durch Ver­wit­te­rung ha­ben sich ex­trem stei­le und ho­he Wän­de ge­bil­det, die ein Er­klet­tern äu­ßerst schwie­rig bis un­mög­lich ma­chen. Durch die star­ke Iso­lie­rung von der Au­ßen­welt hat sich in der Zeit ei­ne ei­ge­ne Pflan­zen– und Tier­welt ent­wick­elt, vie­le der Ta­fel­ber­ge sind noch nie be­tre­ten wor­den. Das Ku­ke­nan Te­pui ist 2 680 Me­ter hoch und et­wa 3 km lang und wird von den Pe­món-In­dia­nern als hei­lig ver­ehrt; seit 1997 darf es nicht mehr be­stie­gen wer­den. Die­se Te­puis sind von Ar­thur Co­nan Doyle als Hin­ter­grund für sei­nen Ro­man „Die ver­ges­se­ne Welt“ be­nutzt wor­den, in dem Di­no­sau­ri­er das Pla­teau als letz­tes Rück­zugs­ge­biet be­woh­nen. Tepuis are table-top moun­tains in the north­ern South Amer­ica con­sist­ing of sand­stone. 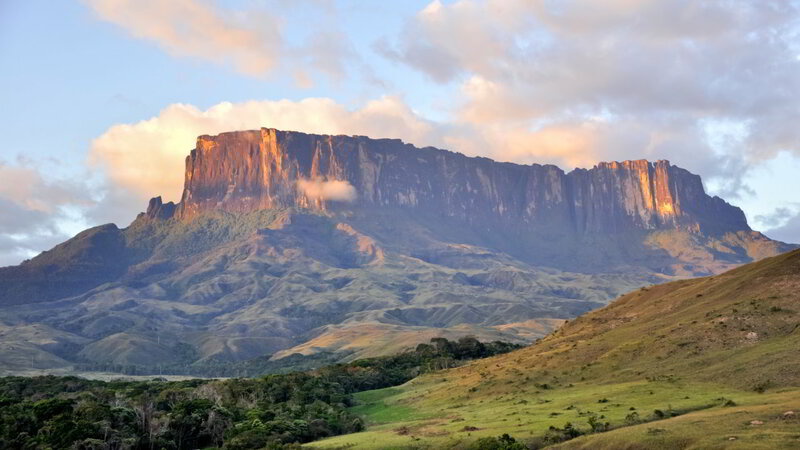 Ero­sion caused ex­tremely high and steep walls which iso­lated the plateau from the sur­round­ing rain­forests and make climb­ing ex­tremely dif­fi­cult; some tepuis have never been vis­ited by hu­mans. Strong iso­la­tion from the outer world caused the emer­gence of an own flora and fauna. The Kuke­nan tepui is 2 680 m high and ap­prox­i­mately 3 km long and con­sid­ered sa­cred by the in­ge­nious Pe­mon na­tives; since 1997 the tepui has been for­bid­den for climbers. Arthur Co­nan Doyle used tepuis as back­ground in his novel “The Lost World” where di­nosaurs are still liv­ing iso­lated from the rest of the world.